The best time for visiting is in the morning. Drive in the direction of Krabi town. Follow Highway 4 until about 13 km before the town. You passed already the highway to Suratthani and a weight bridge for trucks. Look for a road to the right with the sign Royal Residenceand turn here to the right. Follow the signs Royal Residence , Khlong Muang or Ban Natin, sometimes written as Nateen. In the center of Nong Thalee (Thalay) turn to the right andfollow the sign to "Khlong Muang". After 1.8 km the main road bents to right, follow the road to left to Noppharat Thara Beach". The garden is at 1.8 km on the right side of this road. The sign for the Natin Spicy Garden is on your left side at the entrance. Turn right, the garden is 80 meters inside the soy. Continue the road in the direction of Krabi Town. 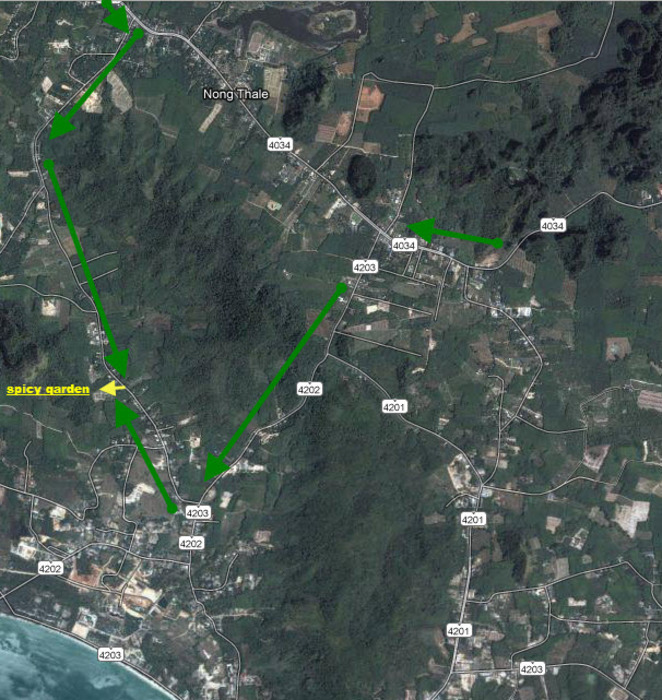 About 5 km for Krabi you will see a Shell station and a stop light. Turn here to the right and follow the road 4034 to Chong Pli. Coming from the East (High way 4) Trang and Krabi Airport. 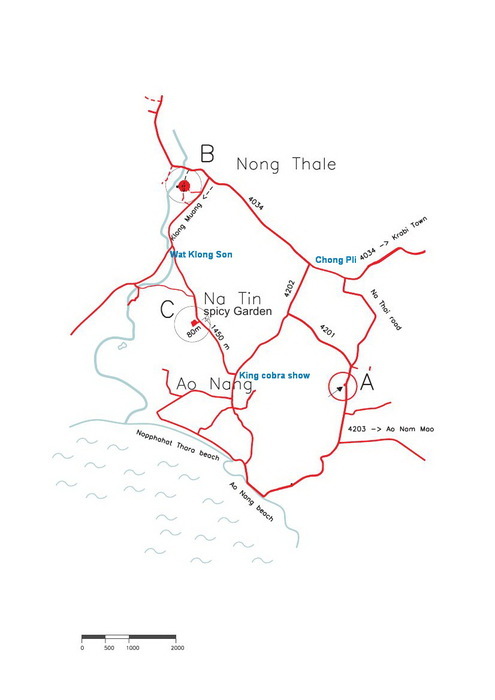 Follow the direction Phang Nga or Phuket. At the T-cross point turn to the left to Krabi (road 4200). 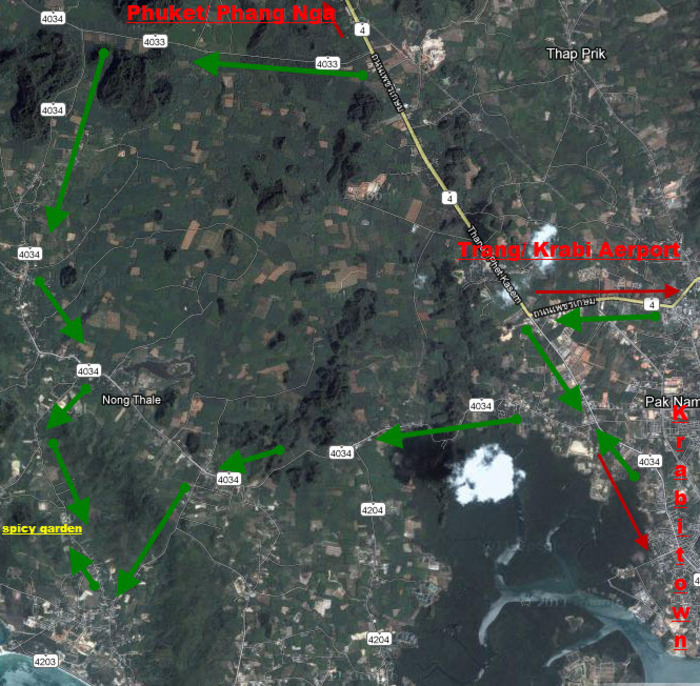 High way 4 continues to the right to Phang Nga and Phuket. Continue this road to the Shell Station with stop light and turn right. Follow road 4034 in the direction to Ao (phra) Nang and Klong Muang". Follow the signs to Phang Nga or Phuket. At the stoplight by the Shell station turn to the left Follow road 4034 in the direction to Ao (phra) Nang and Klong Muang. 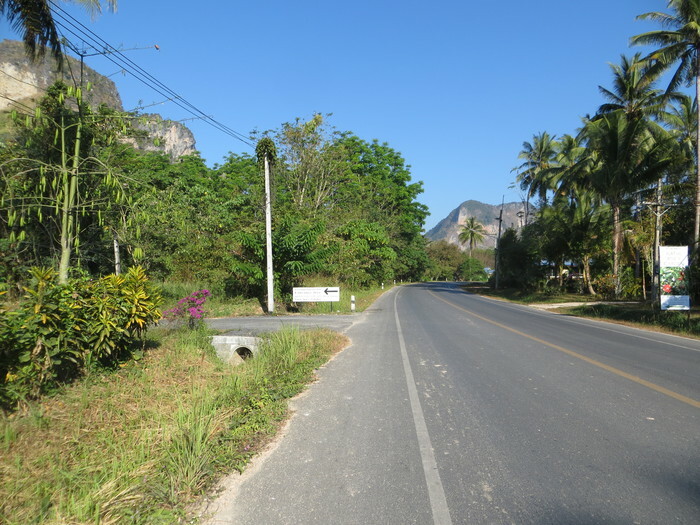 Follow the signs to Ao (phra) Nang ,Ban Natin or Noppharat Thara Beach (this is road 4034). 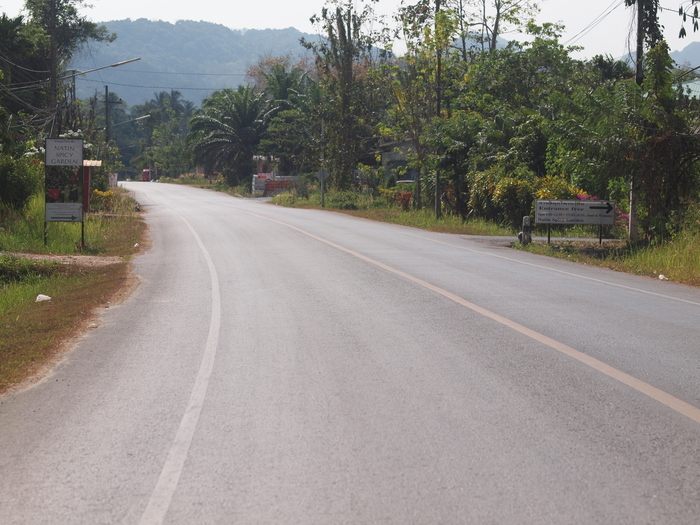 After about 8.7 km in Chong Pli there is road to left. Follow this road to Ban Natin and Nappharat Tara Beach. The entrance of the garden is on this road at the left side after 1.45 km. The sign Natin spicy garden is on your right side of the road at the middle of the entrance. Turn to the left, the garden is 80 m inside the soy. I am very sorry to speak too bad Thai for Thai excursions, my English is better. So, if a group of Thai people wants a guided tour I will have to arrange a native Thai speaker with knowledge of plants in this garden. I know a good guide but I need time to make an appointment with him. Please inform me in time. If groups (5-15 people) want a guided tour on an other times or on other days as motioned above, please make a telephone call to me or send a mail. There are many rubber trees around the garden. So there can be many mosquitoes especially in the rainy season. 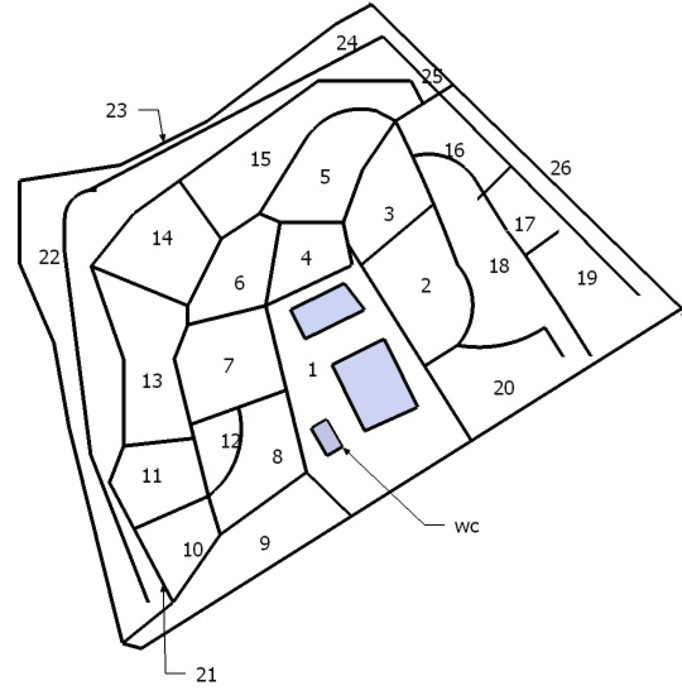 The plants in the garden are vegetables, fruit trees, timber but also medicinal and toxic plants. Unless you know what you are doing: Do not eat fruits, leaves, seeds etc. Keep an eye on children who like to eat the nice fruits or seeds.